Crab surprise is an entree prepared by the gourmet chef for the guests that stay at the Rifflin'Hitch Lodge in Southern Labrador in Labrador, Canada. On beautiful Labrador evenings, the outside seating area is a fantastic place to eat your entree accompanied by a glass of white wine. 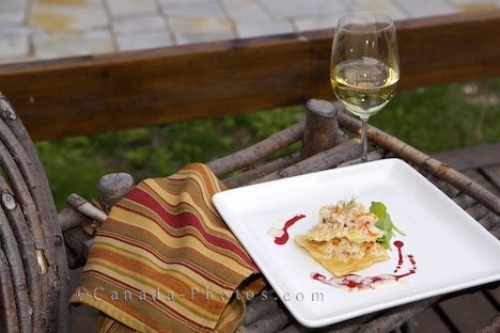 A gourmet entree - Crab surprise in an outside setting, served at the Rifflin'Hitch Lodge in Southern Labrador, Labrador, Canada. Photo of a gourmet entree and a glass of white wine served outside at the Rifflin'Hitch Lodge in Southern Labrador, Canada.